The setting was Guru Nanak Gurdwara, Holy Bones, Leicester on the 27th November an event oragnised by the Panjab Cultural Association (PCA), the International Panthic Dal (IPD) and the Khalsa Youth Club (KYC). The guest speaker was Gurinder Singh Mann, historian and Author with a decade of research in Sikh history, culture, and manuscripts. Gurjit Singh Walia described Gurinder Mann as a scholar who had worked tirelessly on researching Sikh history and the bani of Guru Gobind Singh. 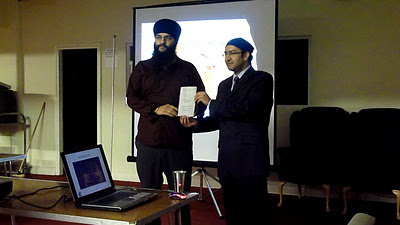 Mann started off the lecture by describing his past projects and scholarly activities spanning a decade including his involvement with successful heritage website www.sikhnugget.com and the www.sridasamgranth.com, various articles and his recent book SriDasam Granth Sahib: Questions and Answers. He expanded on the various initiatives of the Panjab Cultural Association including the celebration of Dastar Day and the presentation created for it. Mann explained about an online Panjabi learning resource called Cybersikhi which would be released soon and a Gurmat Sangeet initiative and an interfaith event the organisation was involved in. Then Mann went through why the PCA had commissioned the Project of the Panjabi translations of Dr Leyden, citing the goals of the project was to bring the translations of Dr Leyden to life, including the setting up of a website and the development of a booklet. 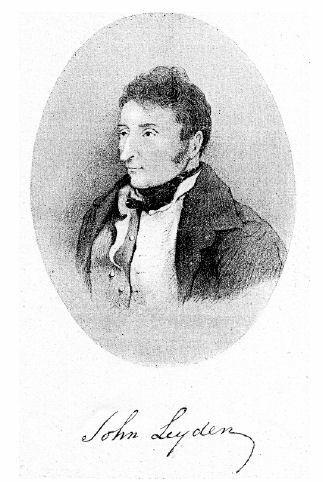 Mann explained that Dr Leyden from Denholm, Scotland was adept in several languages and trained to be a preacher and is more famous for his poetical works. However his fascination and desire to look at Indian manuscripts and languages led him to travel to India. He however was not allowed to travel without appointment, so he quickly acquired the training to be a surgeon and henceforth his journey to India. It was through his connections that he took up a post at Calcutta at the famous Fort William College, as the Professor of Hindustani. It was here Dr Leyden undertook various translations of Indian works in several languages.As part of these translations two important manuscripts have come to light which are located in the British Library. 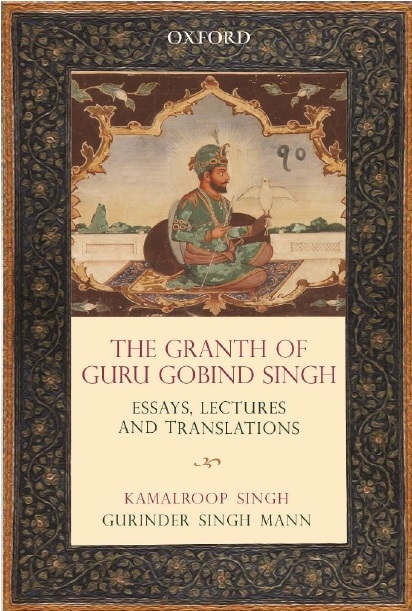 These manuscripts contains translations from Panjabi into english and are mainly related to the religion of the Sikhs.The translations include the Sri Bachitra Natak (Wondrous drama) written by the Tenth Guru Of the Sikhs, Guru Gobind Singh, in which he describes his own battles, his lineage and the reason of his coming i.e. to spread righteousness in the world. There is also a rare unknown work called the Kurka Of Guru Gobind Singh and a full translation of the Prem Sumarag Granth (The true path to love). The translations are significant as they are appear to be the first english translations of Panjabi texts which shows the extent to which the British wanted to understand the culture and religion of the Sikhs. Mann explained the significance of the translations including how his discovery of the Prem Sumarag Granth translations in 2006 had changed the scholars view on dating of the important text. This was explained in the context of the late Dr W.H.Mcleod who refused to change his view on the dating of Sikh texts but Mann’s discovery could not be ignored and Mcleod had to concede an 18th century date. The Dr Leyden translation of the Sri Bachitra Natak was also significant as Mann explained that the only person to take note of his translations was statesmen and Governor of Bombay, Lt. Col. John Malcolm. Writing in his Sketch of the Sikhs published in 1811, he states that he had acquired translations from Dr Leyden. 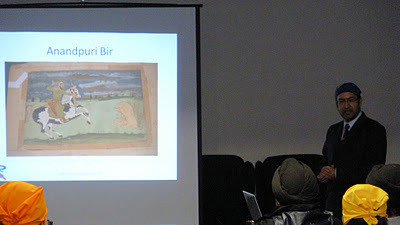 Mann who has catalogued many manuscripts in India and the UK, delighted the participants to the lecture by showing rare visuals from the Anandpuri Bir (dated 1695/1696) of Guru Gobind Singh. Showing the importance of Sri Bachitra Natak, he stated that even Dr Leyden’s translation acknowledged that the bani was one part of the Dasam Patshah Ka Granth. Another translation undertaken by Dr Leyden was that of the Var commonly attributed to Bhai Gurdas Singh (2nd), known as the Var Sri Bhagauti ji, which shows the ideal form of the Khalsa. If was fitting for this project to be undertaken as in August 2011, it was the 200th death anniversary of Dr Leyden. The project has also attracted the notice of the Scottish and a distant relative of Dr Leyden, Marjorie Gavin, has been appreciative of the PCA’ s role in noting Leyden’s contribution to translations. She stated " Dr leyden mastered over 30 Oriental languages, become a minister, surgeon and naturalist, bring him fame as a poet and linguist and earn the respect, admiration and friendship of Sir Walter Scott and other eminent members of 19th century society before travelling to India and an untimely death in Java. A genius had been born - Dr John Leyden". The release of Dr Leyden’s Panjabi Translation booklet. Gurjit Singh Walia (L) and Gurinder Singh Mann( R). Gurjit Singh Walia welcomed the contributions and original research made by Gurinder Mann in his lecture and opened up the floor for questions where he gave answers to questions on manuscripts, Sikhism and Women, and the Importance of Sri Dasam Granth Sahib. Mann thanked the International Panthic Dal and the Khalsa Youth Club and the Guru Nanak Gurdwara Committee many of whom were present in holding the important event. The many volunteers who had worked on the project were also thanked for their services. The lecture was well attended with participants from London, Manchester, Nottingham, and Coventry including academics, students on Sikh courses and members of the media. Jaspal Singh from the Khalsa Youth Club summed up the event by saying, “Gurinder Singh Mann had given a illuminating lecture on the relationship between the British and the Sikhs and it was clear the Panjab Cultural Association had effectively preserved the works of Dr Leyden’s and his contribution to the Panjabi and Sikh community.” A small booklet on the PCA project was also released entitled Dr Leyden’s Panjabi translations. More information on the project visit Panjab Cultural Association: www.5culture.org. The booklet, The Dr Leyden Panjabi translations available from: www.archimedespress.co.uk.